Welcome to Imprint Friday and today's featured imprint: Harper Perennial. Stop by each week to be introduced to a must-read title from one of my favorite imprints. I know you'll be adding many of these books to your wish list. Let me admit right from the start that I didn't know who Caitlin Moran was before I read her Moranthology. If you're more well informed than I am, then you already knew she is a long-time columnist for the London Times and that her first collection of articles, How to Be a Woman, won the 2011 Galaxy Book of the Year award. The follow-up to Caitlin Moran's breakout hit, How to Be a Woman—A hilarious collection of award-winning columns, available to American readers for the first time ever. Possibly the only drawback to the bestselling How to Be a Woman was that its author, Caitlin Moran, was limited to pretty much one subject: being a woman. Moranthology is proof that Caitlin can actually be "quite chatty" about many other things, including cultural, social, and political issues that are usually the province of learned professors or hot-shot wonks—and not of a woman who once, as an experiment, put a wasp in a jar and got it stoned. Caitlin ruminates on—and sometimes interviews—subjects as varied as caffeine, Keith Richards, Ghostbusters, Twitter, transsexuals, the welfare state, the royal wedding, Lady Gaga, and her own mortality, to name just a few. With her unique voice, Caitlin brings insight and humor to everything she writes. Right from the start, Moran's humor shines through as she tells the story of how she became a teenage columnist for the Guardian and eventually the Times. She is frank about her struggle find her voice, which she boils down to this: pointing out cool things while being silly and polite. Based on the articles in Moranthology, she has mastered her niche. I was pleasantly surprised, however, to find that behind the silliness and self-deprecating humor, Moran has an agenda, and many of the issues that are important to her are also important to me. If you watch the entire video embedded at the end of this post, you'll hear her switch from funny to serious as she talks about the Internet and the pay wall. Moranthology also includes her thoughts about cultural tolerance, libraries, the British royals, and social media. Moran's issue pieces make up only one facet of the collection. Among the celebrity pieces reprinted here are her moving tribute to Elizabeth Taylor and hilarious interviews with Kieth Richards and Paul McCartney. Television and movie reviews cover Downton Abbey and Ghostbusters. 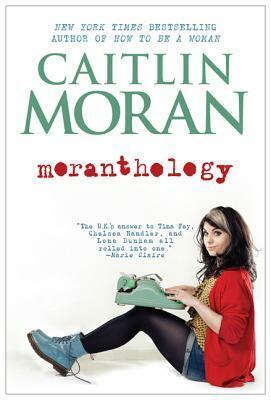 Read Caitlin Moran's Moranthology one article at a time or dive in and devour it in one sitting. Either way, you'll love the cool things Moran points out, you'll laugh at the silly stuff, and you'll appreciate her underlying politeness. To learn more about Caitlin Moran, visit her website or follow her on Twitter. Harper Perennial is a featured imprint on Beth Fish Reads. For information about the imprint, please read the welcome note, posted here on June 18, 2010. To discover more Harper Perennial books, use the Topics/Labels pull-down menu in the sidebar. I encourage you to add your reviews of Harper Perennial books to the review link-up page; it's a great way to discover Good Books for Cool People. For more about Harper Perennial, follow them on Twitter, Tumblr, or Facebook. This sounds like a great series of books. I am adding this to my wishlist. I do enjoy a book where you can skip around...hunting and pecking as it were. I just posted my review of Moranthology this week. I really must read her first book, I just love her voice. Thank you SO MUCH for posting about this. I read How To Be A Woman last month and just LOVED it. I love her. I want more of her. I want to hear what else she thinks. She's my "new best friend" in spirit. Off to order this right now! I just listened to How to be a Woman on audio and I loved it. Listening to Moran reading made all the difference, I think. I think I'll get this one in audio too. And you're right, she is funny but she also cares about lots of important issues and knows how to phrase things so that they hit home. I was curious about this one... Definitely debated taking it! Audio might be the way to go.